This is a huge beer ladies and gentlemen . 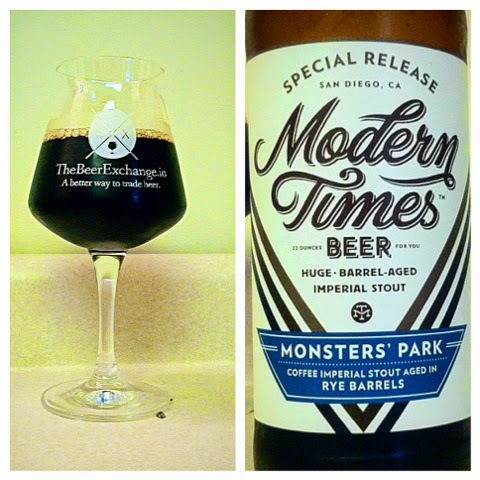 This is Modern Times special release of their Monster Park , which is an imperial stout , then aged in 3 different variations of barrels ; The first is in rye whiskey barrels , the second is rye whiskey barrels with there own coffee added , and the third is aged in Tennessee whiskey barrels . This one is the Rye with coffee added . Another fact to know is that Modern Times is one of few known breweries to actually use there own blend of coffee into their beers . Let's get a pour on the Monster Park / Coffee Imperial Stout. Pour : It is black as pitch . I thought I was going to get some head on this massive beer , but I was mistaken . The head that was there was a light brown hue , but dissipating rather quickly , and being 13% I understand that . I can see the alcohol legs on this beer clearly , streamlining along the glass . Almost reminds me of Black Note stout from Bells. Aroma : Wow , lots of coffee on this imperial stout . I didn't want to age this one to long and decided to drink it fresh so I can get the coffee at it's peak , but lots of dark roast coffee , oaky- vanilla , dark fruits , powdered chocolate , a strong presence of the rye coming through . This reminds me of Bells Black Note Stout and a little bit of Bourbon County Brand Stout . Very unique blends of coffee that they are using . Taste : Huge amount of coffee bitterness followed by chocolate , powdered chocolate you get from Nesquick, vanilla , rye , and a lot of sweetness . What I'm really surprised about this beer is that the mouthfeel is very thin for a coffee imperial stout , it's super thin. I get a lot of flavors though , but I was expecting a thicker body on this beer , so it coats my palate better and I get flavors in the back of my throat . I'm not saying it's a bad thing , but very surprised that it was this thin. It is very similar to Black Note Stout , and has a KBS body . It's really good , but just a tad to thin for me . Verdict : 93/100 . I think if it had a better body , and a touch more of carbonation , it would be right next to the top coffee beers I have had . It's still a trade worthy beer for sure . It's got a lot of coffee still , and a unique blend of chocolate and malts as well . Cheers ! Also huge thanks to The Beer Exchange for this sweet Teku glass . Awesome part of my growing glass collection . Check out their website too! Made great trades off of it .